Like many, I had tuned out annual updates on the progress of strategic arms control after the fall of the USSR. I assumed that thanks to the work of many, including that of International Physicians for the Prevention of Nuclear War (IPPNW)– which gained them the Nobel Peace Prize in 1985–the world was on track to continue reducing nuclear weapons stockpiles of the superpowers and contain proliferation. But in recent years, headlines about deteriorating US-Russian relations and nuclear threats from N. Korea and Iran have disturbed my slumber. 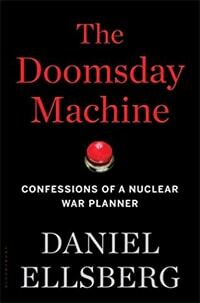 Then, exposés like William J. Perry’s My Journey to the Nuclear Brink, and Daniel Ellsberg’s Doomsday Machine: Confessions of a Nuclear War Planner have caused me to awake, as from an nightmare. Our species and most others are at risk of extermination, omnicide, from our insane idolatry of thermonuclear weapons. Born in 1931, Ellsberg came of age as a brainy Harvard whiz kid in the nuclear age. His mastery of economic theory and game theory drew him to the war department contractor RAND Corporation and its nuclear war planning work. What began as an abstract intellectual challenge became for the patriotic ex-Marine a struggle to save humanity while working from inside the military, intellectual, industrial complex. Ellsberg aptly follows other writers in comparing the evil of the U.S. and Russian plans for omnicide in the name of “deterrence” to the evil of the German Nazi regime plans for genocide. Both involved the cold, clear-eyed design and operation of efficient industrial processes operated by willing ordinary citizens, military and civilian. These machines have operated largely hidden from public view and rarely have crossed the public mind. When they have done so, as in the Cuban missile crisis, their awful aspect is quickly obscured by secrecy, lies and shows of civilian defense. Vocal opponents of nuclear weapons–including scientists and religious peace activists–have largely remained on the fringe of public discourse. The “confessions” of Ellberg’s sub-title are real. For example Ellsberg admits that his embeddedness in the doomsday machinery led him during the Berlin crisis of 1961 to cause Roswell Gilpatric, Deputy Secretary of Defense, to publicly threaten the USSR with a first strike nuclear attack, which backfired by humiliating Khrushchev and motivating him to deploy nuclear weapons to Cuba. As he and others describe based on decades of research of US and Soviet archives, the Cuban missile crisis almost led to World War III. Quoting Martin Luther King, Jr, Ellsberg closes his book with an eloquent plea for urgent action to defuse the doomsday machines of the U.S. and Russian Federation. He makes clear that the task for PSR and allied groups is to keep the risk of omnicide as well as public health dangers of nuclear terrorist acts and accidents in the public eye until an outcry persuades leaders to restart and accelerate strategic arms reduction talks and negotiate new treaties leading to the total elimination of nuclear weapons worldwide.